If you are looking for the ultimate fishing machine this 53 Hatteras Sportfish is for you! Fully refit with modern day equipment and esthetics, this vessel is truly one of a kind. 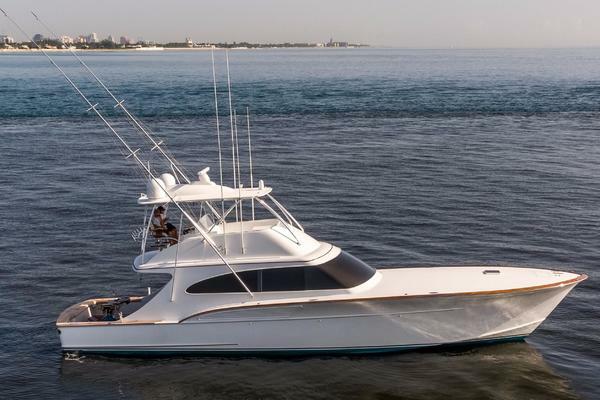 The Hatteras 53 Sportfish already holds an a near impeccable reputation amongst convertible sport fishing boats however this vessel goes several steps further. One of the only drawbacks to this model when it was in production was that the factory 475hp Detroit Diesels could barely get this hull out of the water which is something you will never need to worry about again because "Fishing Machine" now packs a whooping 1600HP! The engines are NEW (only 28 Hours). Fishing Machine also features modern technology such as ZF transmissions with ZF electronic controls, to an 11 KW bow thruster. The interior has been fully modernized by the same designers used at San Lorenzo Yachts. If you are a fan of classic Hatteras Yachts and do not want to sacrifice performance to own one, or want a high performance yet stylish fishing boat but do not want to break the bank, this beauty is for you. United Yacht Sales New Jersey would love to guide you through a personal showing of this 53' Hatteras 53 Convertible 1972. This yacht for sale is located in Malta Italy and priced at $498,000. For a showing please contact us by filling out the form on this page and we will get back to you shortly! 1 Kohler Generator 11kw 100 Engine Hours. Bow Thruster 11 Kw Side Power. (Double Station) Electronic Throttles ZF (Double Station) Propellers 4 Blades. Fuel Tank 3 X 1000-Gal Stainless Steel. Water Tank 210-Gal Stainless Steel. Eco Sounder Raymarine DSM 300 Plus Transducer 1000 Watt. Anchor Windlass Lofrans 2000 Watt. Air Conditioner Also in The Flying Bridge. Sony Marine Radio in The Flying Bridge. Anchor Bruce Stainless Steel 88 Lbs. 1 Refrigerator Vitrifrigo Stainless Steel 21-Gal in The Cockpit.